Or, perhaps you are thinking of buying one? 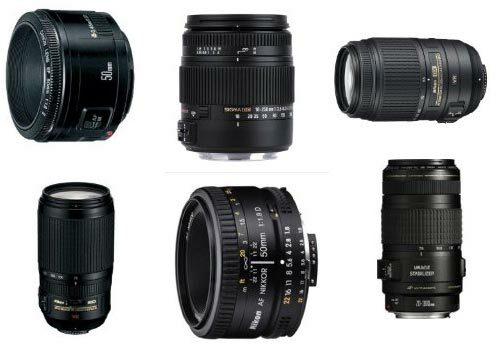 The most important items that photographers own are lenses. It is best to approach a new lens with a method in mind. That way you will get more out of the lens. In this article we are going to look at learning about your new lens. You are probably going to spend a lot of time with your new lens. It will become like a friend to you. Treat it well, and with respect, it will last a lifetime. Abuse it and you will lose it. To get to know your new lens you need to make its acquaintance. Here are some suggestions as to how you should get to know it. Read the manual: You would be surprised how many people pop the lens on and disappear over the horizon. Then they get into trouble and wonder what to do. My dad used to say “If all else fails, read the manual!”. Well, I prefer to do it the other way around. Read it first. Stop, think, and read. I find that a quick skim is usually enough. Lens manuals are usually pretty thin. Then, as I slip out the door to try my new lens I pop the manual in my bag so it’s on hand in case I need to solve a problem. Make sure you find out where the various controls are located and what they do. It would be tragic to miss a good shot because you did not know which vibration compensation mode to select for example! Shoot off about ten shots: You probably won’t achieve much, but it will make you feel better. I always feel better once I have used a new lens, then I can concentrate on learning it properly. Minimum focusing distance: Get in close to a test subject. Take a shot. Take a step back and take another. Repeat this a few times until you are well into the normal operational zone for the lens. Do the same for a few other angles on your subject. Now go and download the pictures. How does the new lens cope with close ups? Does it do a good job or does it need a little separation from the subject before it comes into its own? Testing its zoom ability: Zoom lenses make it too easy to shift up and down focal lengths at will. It’s great for getting the view you want. But it is terrible for understanding how the new lens performs at each focal length. Try setting the focal length in one place then leaving it fixed in position. Don’t shift up and down when taking shots. Walk back and forth so that you get a feel for the lens at one fixed focal length. After taking say, twenty shots, at one focal length, try a slightly longer one. Take another set of shots at that one, then move up the scale again. Try to build up a picture of how your lens behaves at each focal length. The pictures will enable you to see the photographic quality and lens effect at each point in the zoom range. This exercise shows you what sort of perspectives the new lens will give you. Aperture effects: Change of aperture has a big impact on a picture. In particular the depth of field is affected. Get a feel for the Depth of Field expressed by the new lens. Start by taking a few pictures with the aperture open wide. Then, work through the different F-stops (f4, f5.8, f8, f11, f16 etc) taking pictures each time to get a feel for the different depths of field this will give you. You should test the impact of your aperture at a range of “Distance-from-subject” points. You should also do so at various focal lengths. Then you will have a good idea of the way that depth of field behaves with all aspects of the lens. One other point on depth of field. Check your sensor size. A small sensor will give you sharpness right through the picture at larger aperture sizes than a large-sensor camera. Large format cameras will need much smaller aperture sizes to get the same right-through sharpness. If you are swapping your new lens between cameras this will have an impact. I use several of my lenses on a small format Canon and a full frame Canon. Be aware they will behave in a different way on each camera. Testing the telephoto capability: If your lens has telephoto components then you should look to doing a few longer distance shots or landscapes. Repeat the telephoto shots at different apertures and focal lengths. You are looking for how the wide-angle shots compare to the long focal length shots when the field of view is narrow. When you examine these on the computer check for any distortions and check to see how the background comes out. Auto-focus: It is difficult to test the auto-focus control without setting up instruments to calibrate it. Most of us don’t have those. So what I do is focus along things. For example, I put my test subject next to a wall so I have to look down the wall to shoot it. Try the auto-focus out on each of the focus points. If they focus accurately on the subject and are not confused or affected by the wall then what is the quality of the result in the final pictures. Do it first on one side then the other so all the focus points get a go at being next to the wall. Another test for the auto-focus is to try and focus on something tiny like a bird at twilight. Auto-focus finds low contrast light situations difficult. So test them out. When will it hunt rather than focus? At what sort of light intensities will hunting begin? Also, try out any auto focus modes to ensure you know, for example, how your autofocus will behave when panning compared to a still subject. Getting to know your new lens takes more time than a few tests. Honest appraisal requires continuous use in lots of different situations. When I buy a new lens I shoot with it every day – sometimes for months. This really gives you the feel for what it can do. And, you will be learning to rely on it. Once you can rely on it, that will be when your best pictures will come – because you will be using it instinctively. If you are looking for a new lens, here’s how to do it… Amazon’s lens finder . The lens finder is a great tool. Use the selection boxes to set up the sort of lens you need and it will return suggestions for you to choose from. It is a great way to refine the ideas you have to identify the perfect lens for your needs. This entry was posted in Camera control, Equipment, How to..., Insights, Light and Lighting, Things to try, Tips Tutorials & Techniques and tagged Aperture, Auto-focus, Depth of Field, F-Stop, Panning, Telephoto, Testing, Zoom. Bookmark the permalink.